As folks are likely aware at this point, funding for the Lou Frey Institute was vetoed by Governor Scott. The work of the Florida Joint Center for Citizenship falls under the umbrella of LFI, so obviously the loss of funding is, for us, significant. While we continue to work on grants and other opportunities to raise funds (and still seeking some sort of university or legislative solution), this sudden turn of events means some changes in our work. To be clear, the Florida Joint Center for Citizenship at the Lou Frey Institute will continue to support teachers, schools, and districts to the best of our ability. Our curricular resources will not go away; indeed, we continue to refine and improve and expand what we have. The Florida Citizen website will be getting new materials later this year around action civics, high school government, and, perhaps, Florida’s new legislatively mandated Founders Month. Development and improvement on Civics360 continues; we have just added four new videos around benchmark 4.3 for example. We are working on an update to the Florida’s Civic Health website as well. As needed and as possible, we will strive to meet face to face PD requests; however, we may not longer be able to respond in the affirmative to all requests, thanks to a vastly reduced travel budget. HOWEVER, we do have some exciting news that has arisen out of that unfortunate circumstance. The Florida Joint Center for Citizenship at the Lou Frey Institute is beginning the transition towards becoming an online professional development provider! Currently, we are collaborating internally on developing a Canvas-based set of interactive modules (we hesitate to call it a course) targeting new teachers and what they need to know for teaching civics. We will be piloting this effort with a small number of districts for now; lessons learned from this will guide the next iteration and allow us to open it up to more folks. We also plan on offering additional data, content, and pedagogy oriented modules as we move forward. We have also just completed a new online narrated support PowerPoint around interpreting data that we will be posting for you within the next week! We are incredibly excited by this new direction. Sometimes, what seems like disaster can simply be turned into a challenge. And that is true in this case. We have had to ask the question about how we can do more with even less, and we have high hopes and expectations that offering support online, with the same excellent staff you are used to, is a way to overcome that challenge. This Canvas-based approach will always involve the opportunity for questions, collaboration, and communication with the FJCC team. Again, we will continue to support you to the best of our ability. The Florida Joint Center for Citizenship at the Lou Frey Institute is not going anywhere in the short term. We are simply going to follow a new path in supporting the work that wonderful teachers do in civic education. We are always open to questions or suggestions, so please feel free to contact us at any time! The Florida Joint Center for Citizenship: Who are we? With apologies to Lewis Carroll, the time has come, I think, to talk of many things. These many things will be mostly just what the Florida Joint Center for Citizenship is and what we do, as well as projects we have on the drawing board that can help civics educators in Florida and the nation. Besides the resources listed above, we have also partnered with the National Archives to offer a webinar series around their quality primary sources (which you can get to through the links here and here). We have also begun our own ongoing webinar series for Florida teachers, which you can access here and here. This summer, we will be partnering with the DBQ Project to work with elementary teachers in moving their DBQs towards an engaged citizenship model, which we are very excited about. The most significant new project we are launching (which is usable now) is Civics360. Civics360 is an interactive civics review tool to help Florida students improve their understanding of civics. Civics360 is funded by the Lou Frey Institute at the University of Central Florida and provided by the Florida Joint Center for Citizenship, in collaboration with the Escambia County School District, and targets the civic knowledge and skills necessary to succeed on Florida’s Civics End of Course Assessment. I will have a post that provides an overview of Civics360 before the weekend. We also, at this time, provide some level of face to face professional development. I was, for example, in St. Johns this week working with teachers there. If you are interested in PD, please feel free to contact me. The FJCC has a small staff, but, we believe, a great one, and I am grateful for the opportunity to work with such wonderful people. Dr. Doug Dobson: Dr. Dobson is the Executive Director of the Lou Frey Institute and a renowned advocate and leader in civics education in Florida and nationally. It is in many ways his leadership that helped the Justice Sandra Day O’Connor Civic Education Act get passed. Ms. Peggy Renihan: Ms. Renihan is FJCC’s program coordinator, based out of PAEC in the northern part of the state. In many ways, she is our ‘hands on’ person throughout the Panhandle and other areas of the state. She is one of the best PD professionals I have ever had the opportunity to work with. Ms. Valerie McVey: Ms. McVey is the Curriculum Director for the FJCC, and our point person on curriculum development and resources. It is through her leadership, and the work of the rest of this great team and our collaborating teachers, that we have Civics in a Snap, Students Investigating Primary Sources, and our middle school lessons, among others. Mr. Chris Spinale: Mr. Spinale has recently joined us as our new Action Civics Coordinator. He handles our mock election tools and resources, works on a variety of grant and curriculum related projects, and we will soon be planning an approach towards the C3 Framework and informed action. Dr. Racine Jacques: Dr. Jacques is the brains behind the data. She provides us with data analysis on our our resources, as well as on civics teaching and learning in Florida and beyond. Dr. Terri Susan Fine: Dr. Fine is a long time and well regarded professor here at UCF, within the political science department, and serves currently as our content specialist and as associate director of the Lou Frey Institute. Dr. Elizabeth Washington: Dr. Washington is one of the most well-regarded social studies educators in the nation, and is a long time professor at the University of Florida. She currently serves as our pedagogy specialist. Ms. Marcia Bexley: Ms. Bexley serves as the program manager of the Lou Frey Institute. Marcia has worked with Congressman Lou Frey for the last 15+ years and shares his passion for Civics Education. She’s our liaison with the Rotary Civics Bowl and raises money for us through the golf tournament she runs for LFI in joint with the National Center for Simulation, and her local outreach. Mr. Mike Barnhardt: Mr. Barnhardt is our lead programmer and developer. Much of what you see of our web presence is his fine work, and we are excited to begin work on new iterations of that presence this summer, including an additional resource page, a dedicated webinar page, and more. Mr. Lucas Cross: Mr. Cross has just joined us the assistant web developer. Mr. Ryan Hill: Mr. Hill was brough on board to help develop the instructional design behind Civics360. We are very grateful for his work! Ms. Laura Stephenson: Ms. Stephenson is the executive assistant to Dr. Dobson, and in many ways the first person our colleagues and collaborators encounter. She keeps our schedules and makes sure this place runs smoothly. There is a great deal more I can say about our partnerships and our work (with NARA and with the fine folks from CIRCLE, as well as leaders throughout Florida, for example), but I will save that for another time. If you have any questions about the Florida Joint Center for Citizenship, please feel free to contact me at any time! Presenting a primary source-based activity that helps students engage in learning, develop critical thinking skills and construct knowledge. Registration is free and is open for the SOURCES Annual Conference. Register now: http://www.sourcesconference.com/registration. National Archives Berryman Webinar Coming Soon! Friends in Social Studies, we are excited to announce that the Florida Joint Center for Citizenship has partnered with the National Archives Center for Legislative Archives to host a webinar around the legendary Clifford Berryman political cartoons! This webinar will be led by specialists from the National Archives, and is based in part on workshops that NARA’s fantastic Dr. Charles Flanagan has done in the past. Check out the description below, and please be sure to register! You will be sent a link to access the webinar prior to November 2. In this interactive webinar, discover how political cartoons can engage students in today’s elections by introducing the process and issues at a safe historical distance. Practice techniques for analyzing political cartoons in the classroom and learn about additional resources from the Center for Legislative Archives, part of the National Archives and Records Administration. This webinar will last approximately one hour. Registration required. We hope to ‘see’ you there! Questions on the webinar can be directed to me or to Ms. Val McVey, and we will be happy to answer them! Don’t forget that the FCSS Conference comes soon! In our last post, we highlighted some interesting conference sessions that may be of interest to a wide variety of audiences. So how about we take a look at some more intriguing sessions! Teachers will learn Interactive Notebook strategies that connect student learning to the benchmark essential questions, practice test-taking strategies, and connect currentevents to concepts of government. Note: as a civics educator, this sounds fantastic. always looking for new ways to approach instruction! The presenter edits several social studies journals (Social Studies and the Young Learner, CITE –Social Studies, and Social Studies Research and Practice). He will discuss the process of publishing in various social studies journals. Note: This is a great opportunity to learn how to provide service to the field! A Genocide Studies Unit was developed for an undergraduate multicultural course, and studied for its effectiveness in preparing pre-service teachers to implement the State-mandated Holocaust curriculum in grades K-12th. What happens during the first year of a new presidency? This session will address how the president uses the first 100 days of the new administration, organizing Congress, and connecting campaign promises to policy proposals. And of course please don’t forget the fantastic keynote we have lined up! Please be sure to register now! We look forward to seeing you in Orlando. Don’t forget that the FCSS Conference comes soon! I just want to take a few minutes and highlight some interesting conference sessions that may be of interest to a wide variety of audiences. Ravensbruck was the only main concentration camp for women, and it held an astonishing variety of nationalities and reasons for incarceration. It was the last place where gassings took place. Learn about this often neglected aspect of the Holocaust. Join this interactive session featuring new ways to teach about Florida’s famous entrepreneurs. Participate in a hands-on lesson and discover a free tool for creating fun cellphone/tablet quiz games to reinforce and assess student learning. Come learn about S.I.P.S.! Learn how to access and implement a new series of primary source activities and experience new distance learning services from the National Archives to make S.I.P.S. come to life in your classroom! Bring social studies to life for your youngest learners. Join us to discuss engaging, document analysis strategies to enrich social studies discussions in kindergarten through third grade classrooms. 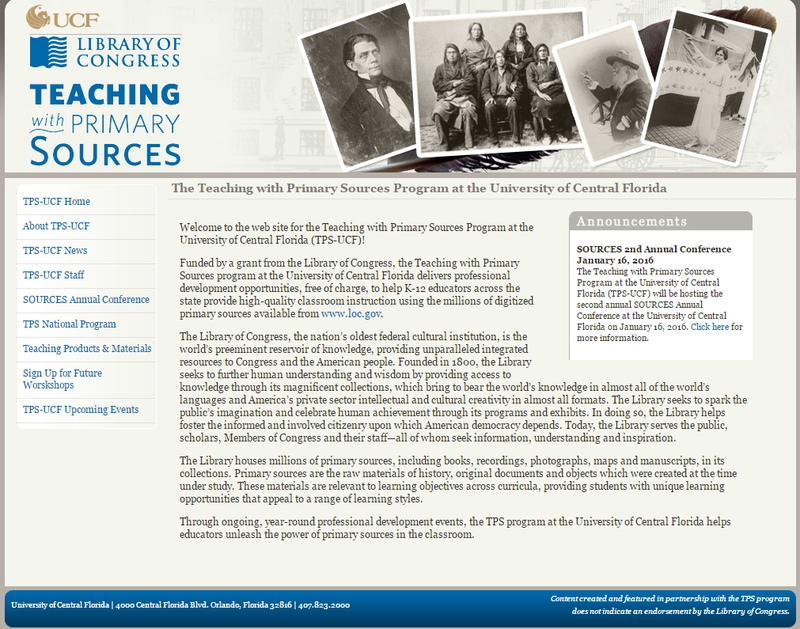 Upcoming SOURCES Conference: Teaching with Primary Sources! Friends, it is time once again to alert you to a fantastic primary source driven conference that is held here at UCF. Dr. Scott Waring, Program Coordinator and Associate Professor for the Social Science Education Program at the University of Central Florida, is organizing his SOURCES conference, and I encourage you to register and attend. Registration is free, and having attended last year’s conference myself, well worth the time. Information on the conference and the registration link is provided below. I hope to see you there!